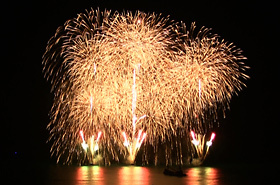 The Nagaoka Fireworks from Niigata Prefecture was launched in the sky of Waikiki on Sunday, March 4, 2012, after the Grand Parade at the 18th Annual Honolulu Festival. The direct translation of the word “hanabi” (fireworks) is “flower (hana)” “fire (bi)”, which has a meaning of the “laying of flowers”. Also, the purpose of the Nagaoka Fireworks is to commemorate those victims, who were killed during the attack on Pearl Harbor and those that were killed by the air raids in Nagaoka City during World War II. On March 2 of this year, Nagaoka City signed a sister-city agreement with the city of Honolulu to foster goodwill between them. Also, the Nagaoka Fireworks can be seen at the Nagaoka Festival hosted by Nagaoka City for 3-days on August 1 through August 3 every year. 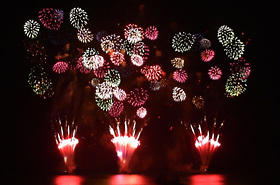 In addition, approximately 1400 shots of fireworks were launched for 15 minutes at the Honolulu Festival. On the other hand, nearly 20,000 shots will be launched for 2 hours at the Nagaoka Festival. The 3 shots of Shiragiku were launched in the night sky to commemorate those victims who were killed during the attack on Pearl Harbor and air raids in Nagaoka City. Also, they were dedicated to foster goodwill between Japan and the U.S. and for world peace. The Silver Star Mines were launched gorgeously, accompanied by a song called Beginning of the World composed by Nobuhiro Ikehata, who is the oldest son of an actor and singer, Yuzo Kayama. The fireworks that depict various kinds of spring flowers were launched along with the rearranged version of a traditional Japanese folk song called Sakura Sakura. The beginning started with the color of pink, which symbolized cherry blossom (refers to a symbol of peace in the U.S.) and then the color turned from pink, white to vivid red. 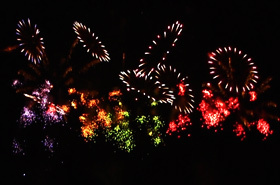 At last, 3 colors of peony shaped fireworks were bloomed in the night sky. The traditional Japanese fireworks were launched, accompanied by the theme song of the movie Blue Hawaii starring Elvis Presley. The main color of the fireworks was blue, which were launched simultaneously from 3 different locations with a slow interval. 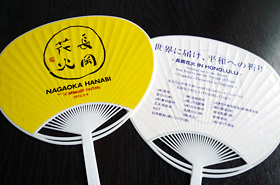 The Mini Phoenix Star Mines were launched gorgeously, accompanied by the theme song of the historical Japanese drama called Ten-Chi-Jin which is popular in Hawaii. These two combination can only be seen in Honolulu.